The Westfest lineup was announced at a media launch on March 14. Musical acts include George Leach, Maria Hawkins, and A Tribe Called Red. The Saturday night headliner is Ashley MacIsaac, and Ottawa’s The Peptides, are opening. Sunday night, as per Westfest tradition, is all about showcasing Ottawa artists, and includes Kitchissippi’s Pony Girl. 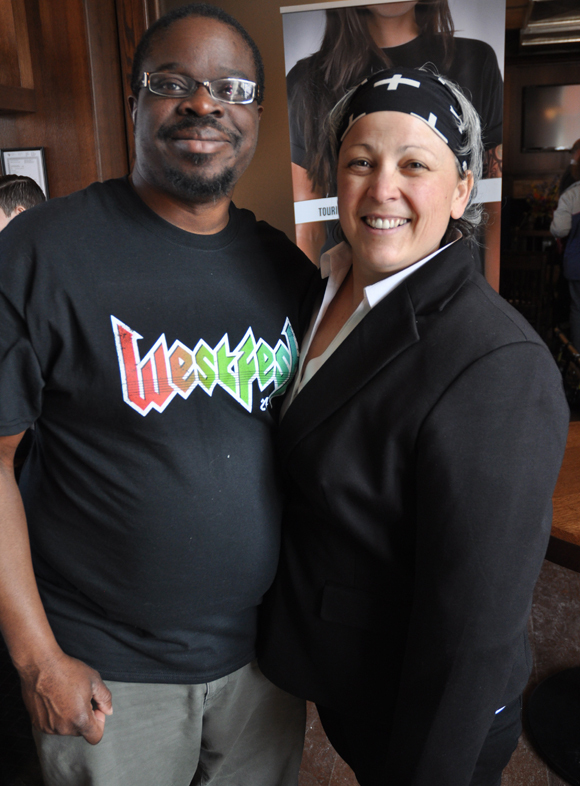 Longtime volunteer Andrew Selormey with Elaina Martin, Westfest founder and producer. Selormey started as a Westfest volunteer seven years ago and is now Main Stage Site Director. Photo by Andrea Tomkins. Westfest will be taking place June 13-15, and the main stage will once again be behind the Real Canadian Superstore. Richmond Road will be closed between Berkley and McCrae Avenues and “fully programmed” with free activities. Christine Leadman, former Kitchissippi Ward councillor and former executive director of the Westboro BIA, attended the launch. She recalls the original incarnation of the Westboro festival, which was called Westboro Days and included a parade and a street party. Part of it was a garage sale too. This will be Westboro Village BIA executive director Mary Thorne’s second year participating in Westfest. She is excited about this year’s musical lineup. MPP Yasir Naqvi also shared his excitement at the official launch event. “Because of Elaina’s passion and commitment, we have one of the greatest free festivals, not just anywhere in Ottawa, but anywhere in Canada,” says Watson. Watson also thanked the local businesses for their dedication and sponsorship, ensuring the festival remains free. Keeping it free for the past 11 years has been a challenge for Martin. She’s recently had to cut her staff from seven full time staff down to two. “I just had to step out of my own box, and stop worrying about this thing. I had to regroup,” says Martin. “I’m happy to do it as long as I can, and I’m going to stop worrying about the future, and just keep planning it. To view the complete lineup go to westfest.ca, or follow Westfest on Twitter @WESTFESTInfo.